Notes: Very few of these were produced - the stamps were issued originally in 1971, and then reprinted on 22nd Sept 1972 with the gum changed to Gum Arabic. Very rare on first day covers. The above Royal Mail Wales 2 1/2p, 3p, 5p, 7 1/2p stamps were issued on 07 July 1971 by Royal Mail and feature the following stamp designs: . 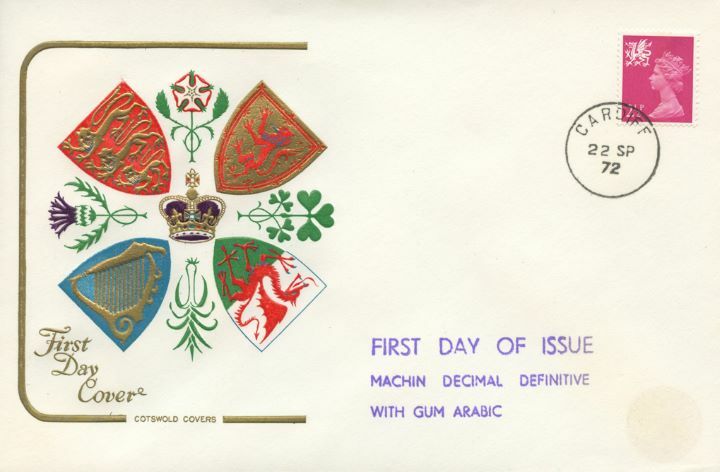 The Variety - Gum Change first day cover with the Cardiff CDS Postmark postmark has been produced by Cotswold and features these stamps which can make a very collectible and lovely gift.